Celebrate the dawn of 2017 in style and ring it in at Allegretto Vineyard Resort's New Year's Eve Celebration, presented in partnership with SLO Jazz Festival. Enjoy dinner, dancing, drinks and a tribute to Frank Sinatra while surrounded by the elegance and joy that only Allegretto can bring! Your Package Includes: Luxury Overnight Accommodations Live Entertainment (A Tribute to Frank Sinatra - Featuring Steven Michael & His All-Stars) Hors d'oeuvres, 5 Course Dinner, & Dancing Champagne Toast at Midnight Complimentary Valet Parking & Wi-Fi Visit our exquisite resort here or book your New Year's stay below. 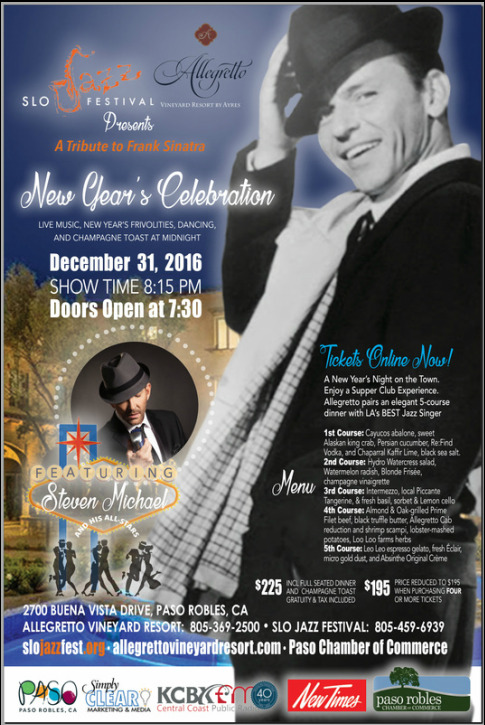 ​Bring in the New Year with class and style at Allegretto Vineyard Resort as we bring in 2017 with the music of Frank Sinatra with special headlining crooner, Steven Michael! A ring-a-ding-ding baby! This is a special concert and party produced by Allegretto Vineyard Resort and SLO Jazz Festival. An equisite 5-course dinner by Chef Eric Olson, NY frivolities, champagne toast at midnight, dancing are provided (taxes and gratuity included). 1st Course: Cayucos abalone, sweet Alaskan king crab, Persian cucumber, Re:Find Vodka, and Chaparral Kaffir Lime, black sea salt. Tickets are on sale December 9 at Allegretto Vineyard Resort, Paso Robles Chamber of Commerce Visitor's Center, and online (see below). Note: There will be a live auction and silent auction and raffle at each concert with exciting items, trips, and bands you can bid upon at this concert, so bring your check book! Auction Items will be updated by December 10, 2016.